Davis, as it turns out, is not the first Christian woman in history to be jailed for a tenet of her expressed faith. Cruz knows this: He talks passionately and frequently about the trials of overseas Christian communities, even though he doesn’t seem to know how to talk to them when he meets them. But even if he meant American history, Davis isn’t even the first conservative Christian woman of 2015 to go to jail, and there’s a rich and long tradition of faithful folk in America choosing civil disobedience to honor their beliefs, on the right, left, and everywhere between. Cruz is a graduate of Princeton University and Harvard Law, a man who has argued cases before the Supreme Court on behalf of the state of Texas. A giant oil painting of himself arguing at the high court hangs in his Capitol office. Yet here he was loudly proclaiming that the authority of the nation’s highest court could — and should — be nullified by minor county officials. 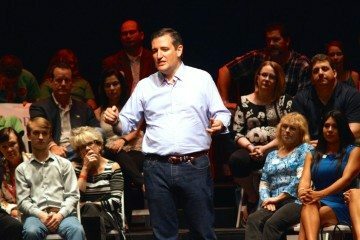 And in the same breath in which he applauded Davis’ one-woman stand against the American legal system, he condemned Obama’s “lawlessness” in his use of executive actions: “When President Obama resigns, then we can talk about Kim Davis,” Cruz said, talking about Kim Davis.